Contrary to what this blog would suggest lately, I actually HAVE been knitting. I haven’t shown much of it lately because much of it is for presents and putting those projects on the blog would ruin the surprise. Here’s what I CAN show you. I finally finished the second sock of this pair of Seasonal Socks. They are my own pattern which you can download from Ravelry for free. These are made with Pigeonroof Studios Siren II Sock, color Bitter Orange. Fantastic yarn that feels as good to wear as it does to knit up. 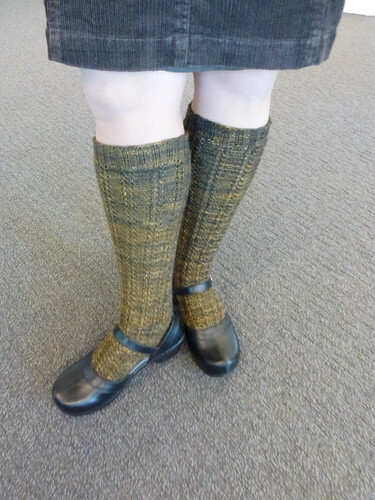 Do hand knit knee socks stay up? Well, these aren’t too bad actually. I’m wearing them in the photo above over nylon stockings, which also helps to keep them up. When I’m walking down the street I have to pull them up about every 5 minutes. I can live with that. I did buy some very thin elastic that I can sew into the top band, but I haven’t gotten around to doing that yet. I can also show you some knitting WIP (work in progress). What a difference, right? 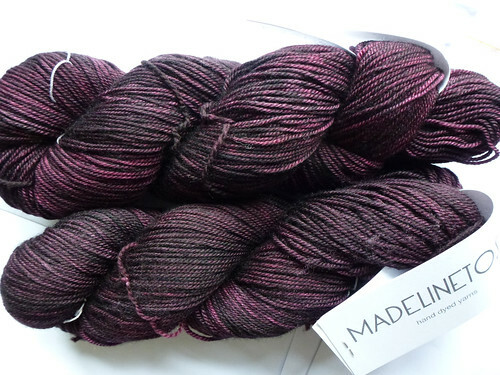 The yarn is Madelinetosh Pashmina, 75% merino, 15% silk and 10% cashmere. It’s luscious. 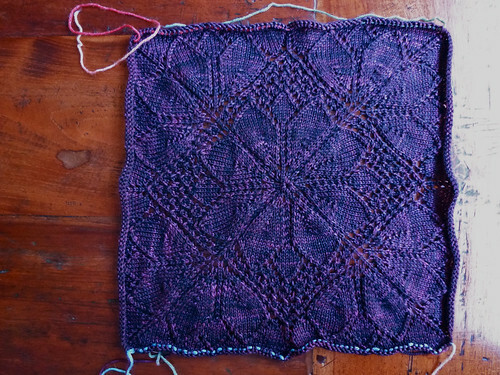 The lace square was supposed to end up at 13″ square but mine is 13 3/4″ square. This is actually good news as it means I can safely knit the 35″ sweater size and it will fit just right. I was undecided whether to knit the 35″ or 40″ size and now I know. I also just finished a birthday present for my niece, which I’ve mailed off to her, and I’m busy with Christmas present knitting, which of course I can’t show you. I hope to post some photos of said niece wearing said FO in the near future. With all the upheaval of putting our house on the marketing, ending one job yesterday and starting a new one tomorrow (commuting to London), knitting (and running) keep me sane and calm. Keep Calm and Carry Yarn is certainly my motto these days. Can. Not. WAIT! Those socks are amazing, auntie! Well, really everything you make is amazing, but I’m so in love with your socks! Just one word for those socks: GEWELDIG! Good luck with the commute, here’s to a quick sale on the house! I thought I would catch up and read your blog, but…you haven’t been catching up here either! BTW every time I try to take photos of purples and lavendars with my camera – the color it captures is blue…same with other folks…not sure why…but it is a dilemma. Can you put some of that elastic in my knee socks too? Good luck also with the house sale and new job. 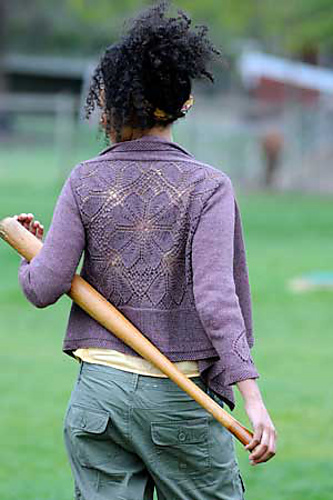 That Dahlia sweater is going to be GORGEOUS! Just GORGEOUS! !